Matthew King is a valuable member to his clients and Green Bridge Real Estate. His creative abilities and marketing aptitude enable clients to meet their goals and maximize the value of their Real Estate Holdings. Over the past decade, he has made a strong statement in the national commercial real estate market. His extensive travel and expertise has given him the opportunity to participate in numerous unique Real Estate transactions in areas such as Las Vegas, Charlotte, Chicago, Atlanta, Austin & Houston Texas, Brevard County, Florida and Strasburg, Virginia. Matthew currently resides in Cleveland with his wife Deanna and their daughter, Isabella. Matthew has worked with a diverse group of clients ranging from the U.S. Court system, high-tech industries, manufacturers, banks, well-capitalized companies, investors and developers. He has broad and extensive experience in all aspects of the marketing, leasing and dispositions of all facets of Real Estate including industrial, hotel/hospitality, land, office, retail, residential sales and unique real property in excess of $100 Million in over 1,500 transactions. He has been involved in both the conventional negotiated sale as well as an accelerated (Auction) method of sale. 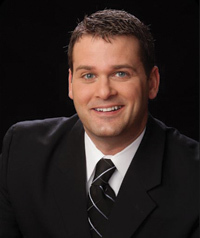 Matthew's entire professional career has been devoted to the brokerage of Real Estate and he utilizes all his available time, energy and resources to ensure the most favorable outcome for his clients. Matthew graduated from Bowling Green University with his Bachelor of Arts Degree in Visual Communication Technology with a minor in Marketing. In addition to the usual coursework for his degree, he added personal selling, internet selling and legal studies, including Contract Law and Mass Tort Litigation. He maintains his membership in the Bowling Green State University Alumni Association and enjoys competitive Sailing, Sporting Clays and Golf. Matthew, a Certified Commercial Investment Member (CCIM), is recognized as a leading professional in commercial real estate brokerage, leasing, asset management, valuation, and investment analysis. As an experienced expert, a CCIM is an invaluable resource to the commercial real estate owner, investor, and user. Please contact Matt today to discuss how his commercial real estate broker services can help you find the best property to suit your investment/facility needs or to facilitate a timely disposition of your Real Estate asset. Please feel free to contact him at: mking@greenbridgerealestate.com.